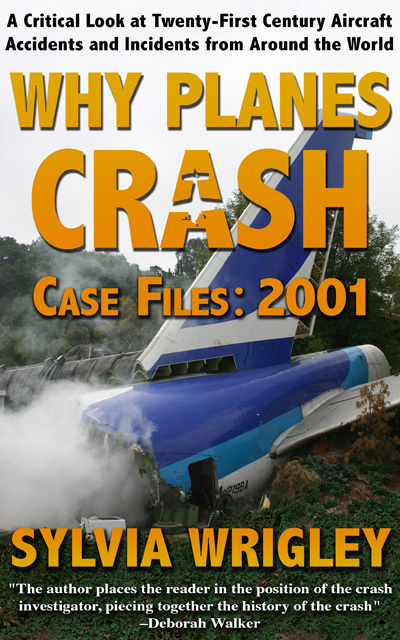 The Air Accident Investigation Unit in Ireland has just released the serious incident report regarding the runway incursion at Dublin Airport on the 21st May 2011. The incident involved two aircraft and two air traffic controllers. The aircraft which infringed active Runway 16 was an Airbus A321-231 registration G-OZBS. G-OZBS was a Monarch flight from Dublin to Tenerife carrying 6 crew and 152 passengers. The aircraft taking off on Runway 16 was a Boeing 737-8AS registration EI-DPT. EI-DPT was a Ryanair flight from Dublin to Vilnius carrying six crew and 145 passengers. The SMC (surface moments control) was provided by the Ground Controller. The AMC (air movements control), including coordination of landing and departing aircraft, was handled by the Tower Controller. 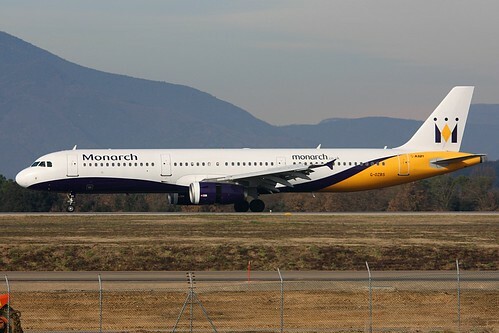 The Monarch aircraft, G-OZBS, was parked at Stand 35 at Pier B, after arriving late from a previous flight. 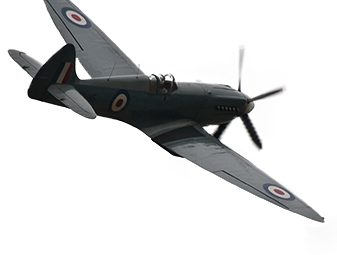 The Captain – the Pilot Flying for the incident – took command of the aircraft for his first flight of the day. Runway 16, a 2,072m asphalt runway, was active. However, G-OZBS requested runway 28, a 2,637m asphalt runway as the aircraft was heavy. This was granted and G-OZBS was cleared by Ground Control to Push Back and start. 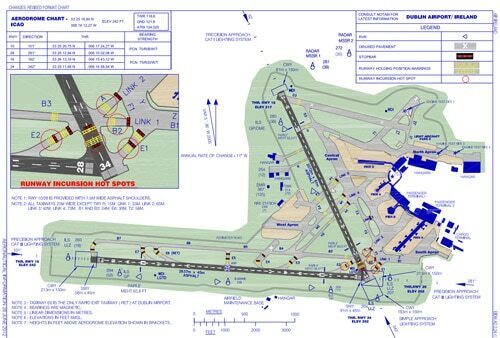 Following along with the chart, you can see Pier B in the top right and Link 2 leading to the taxiways east of where the runway thresholds meet. The red circles mark runway incursion hot spots. At the time of the incident, point A did not have a red circle. G-OZBS was asked to hold short of Link 2 until the incoming aircraft passed. The Ground Controller told him to then continue F1, E1, hold short Runway 28 and then change to the Tower frequency. The next thing the Ground Controller recalled was looking out the window and seeing G-OZBS infringing Runway 16. The landing aircraft taxied to the end of the Runway 16 and turned off onto B2. G-OZBS was at the F1 intersection when the landing aircraft passed it. The Captain of G-OZBS stated that he incorrectly assumed that the landing aircraft was on taxiway F and not on Runway 16, as it was travelling slowly. He further stated that if big bright wig-wags were installed on A, it would have been more obvious that they were approaching an active runway. 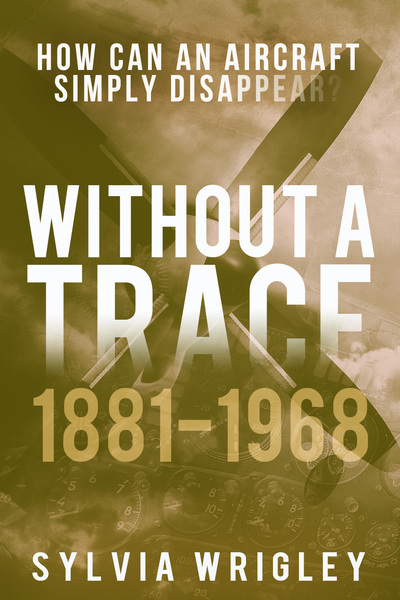 In other words, he completely misidentified the aircraft’s position. 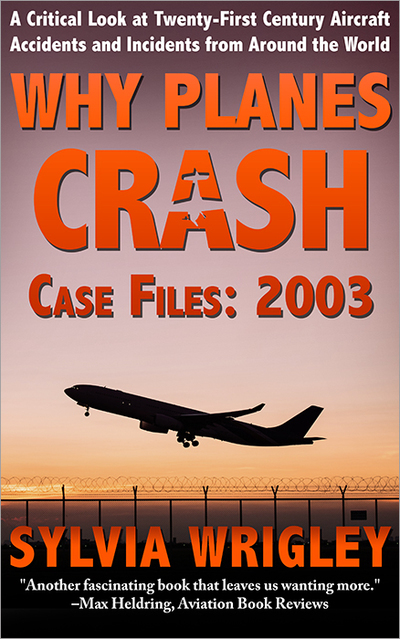 The First Officer said that the tarmac was wet and thus the yellow markings on the taxiway were difficult to see. The Ground Controller stated that she had no reason to think that G-OZBS would not follow her instructions and, having cleared the aircraft to Tower control, she diverted her attention elsewhere. 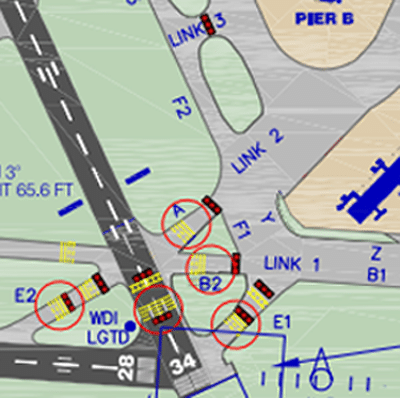 At Link 2, on the intersection of A and F1, the aircraft should have turned left onto F1. Instead, G-OZBS went straight ahead onto A. At the same time, the Tower Controller cleared EI-DPT, the Ryanair flight en route to Vilnius, for take-off on Runway 16. EI-DPT acknowledged the clearance and commenced its take-off run. G-OZBS switched frequency to Tower and entered Runway 16. 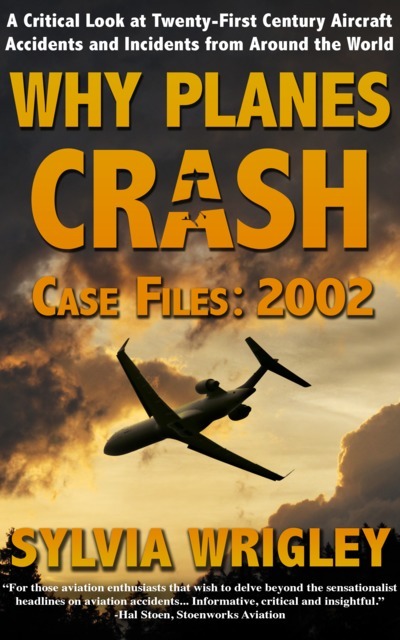 G-OZBS: The First Officer questioned their position and stopped the aircraft on the runway. EI-DPT: The Captain initiated a high speed rejected take-off. When she realised that the taxiing aircraft had entered the runway the Commander immediately abandoned the take-off, thus breaking an accumulating and potentially threatening chain of events, and instructed the PNF to inform ATC. During the take-off run the FDR showed that the rejected take off commenced at approximately 124 kts indicated airspeed, or 4 kts under V1, and a peak speed of 134 kts was reached. The Advanced Surface Movement Guidance and Control System recorded the movements of the planes. At 16:47:39 G-OZBS was recorded at the edge of Runway 16, which it then entered and stopped. At 16:47:48 EI-DPT reached its peak ground speed and commenced decelerating. Total response time: 7 seconds. It was just enough. 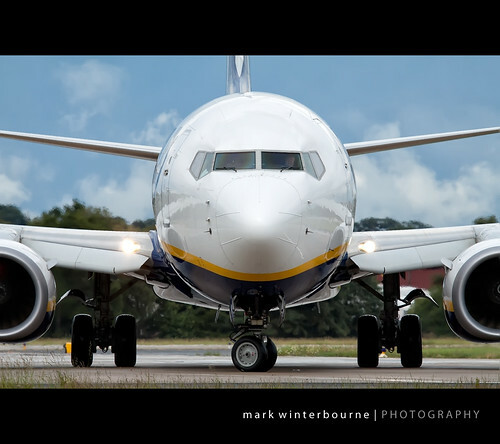 EI-DPT, the Ryanair Boeing 737, stopped 360 metres from G-OZBS having travelled a total of 1,455 metres from the threshold of Runway 16. The Tower Controller told G-OZBS to vacate the runway as quickly as possible onto Runway 28. He then cleared EI-DPT to exit via taxiway A and advised a third aircraft that it was clear to land on 16. “It all happened very quickly,” he said. EI-DPT returned to the stand for a technical inspection of the braking system. G-OZBS lined up on Runway 28. The crew completed their take-off checks and the aircraft was cleared for take-off three minutes later. The flight crew of G-OZBS lost situational awareness, having misidentified their position, and taxied onto an active runway while another aircraft was taking off. 1. Sunshine on a wet pavement probably rendered pavement markings and runway signage less visible to the crew as they taxied directly towards a low strong sun. 2. Crew workload and unfamiliarity with the complex taxiway markings and signage. 3. 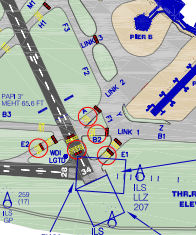 The absence of an illuminated stop bar on taxiway A and the presence of one on E2. I wasn’t actually aware of this incident until I read the report. Fantastic detail with the maps – you could imagine it happening. Luckily the Ryanair pilot was on the ball.